austin | Live more lovely. My trip to Texas was fantastic. I had such a great time enjoying the company of old friends and family. The first weekend I was there was spent at my uncle’s house in Waco. It was the first time my family had gotten together in years. I absolutely adored that weekend. I spent Saturday afternoon hula hooping with my cousin’s little ones, and as the sun went down, drank a few beers with my uncle, aunt, and cousins and enjoyed watching Baylor beat Oklahoma State in football. Up till that game, I had never cared about football, but RG3 changed me! In Austin, we shopped and ate tacos at my all time favorite taco place, Torchy’s! Before we met up with the rest of my friends, we drank bloody marys and fell in love with Rugby (seriously) at the Jackalope. Later on, we met up with a few of my other favorite people at Liberty Bar. It was so amazing to see everyone. I love how so much time can pass between friends seeing each other, but the best ones never seem to miss a beat. We closed out the night hula hooping at Gypsy Bar until they closed. I loved it, everyone got in on the action, even the boys! The next morning before heading back to Houston, we had brunch at Magnolia. I enjoyed a mimosa & the Texas Benedict. My mouth is watering just thinking about the chipotle hollandaise sauce! Texas is FULL of good food. My dad kept his fridge stocked with kolaches for me every morning. If you’ve never had a kolache before, you’re missing out! They are delicious little sweet buns with sausage, cheese, and jalapenos inside (or any number of variations). The original kolaches were made with sweet fruit, but the jalapeno variation is my favorite. I’ve been going through withdrawals since I came back to Florida, so tonight I’m making my first attempt at kolaches from scratch! Don’t worry I’ve been taking lots of pictures, so if it’s a success – I will share the recipe & how to love! Yesterday was the anniversary of the Repeal of the 18th amendment. On Dec. 5, 1933 Prohibition ended & on Sunday night, we CELEBRATED. 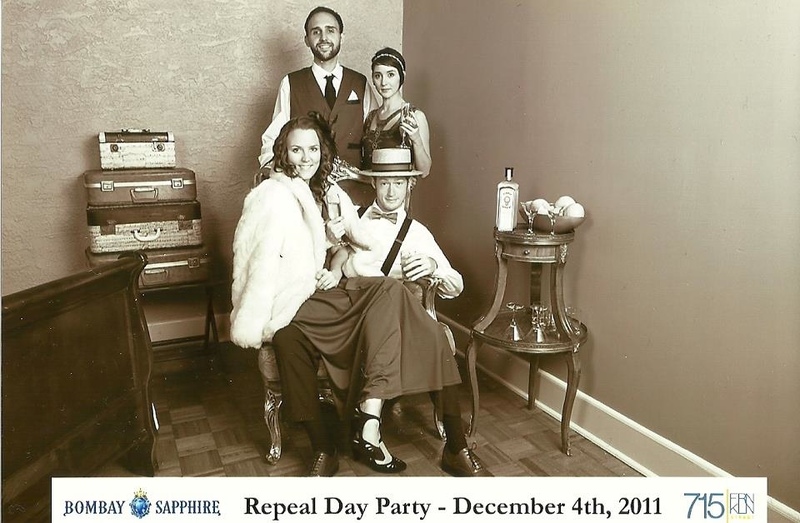 We went to the Left Coast Bartenders Guild‘s Repeal Day Party in Ybor City at the historic don vincente hotel! The entire hotel was booked for the event. It was thirties themed with live jazz music and a burlesque show. There were bars hidden all over the hotel serving up old timey cocktails. We even found one in the elevator! I was served champagne, going UP! My favorite drink of the night was called a ‘French 75’. It was champagne, gin, and lemon, and it tasted amazing. Here is a picture of the four of us. Not bad for throwing costumes together the day of, right?